How many times have I had to type the words “not dishwasher safe” in this blog? Too many. But here is a handy little gadget to help with the hand washing. 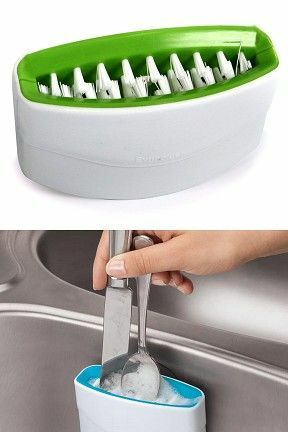 This cutlery cleaner uses suction cups to attach to the side of your sink and non-scratch bristles to cleanup that dirty cutlery. Kind of works like a golf ball washer. There has been complaints that the suction cups don’t stick well or hold up to the action of running the cutlery through it. The trick I’ve found in these situations (especially with stainless steel sinks) is to make sure the sink is very clean and then attach the suction cup with a little dish soap and then let dry over night. Works like a charm.